Peg Kirby’s Story - Fairlawn Brought Me Back - 28 years & thousands of comeback stories. Tell Us Yours! Although she and her husband Carl have 10 grandchildren, Peg Kirby is far from your typical grandmother. A risk taker by nature, she is a licensed pilot who’s dabbled in sea kayaking and hang-gliding. She and Carl even lived in Alaska for a year just for the experience of it all. “I guess I’ve always enjoyed the adrenaline rush of doing adventurous things. It makes me feel alive,” says Peg, who is also an avid motorcyclist. And it was during an end-of-summer ride on her Yamaha back in 2009, that Peg’s adventurous lifestyle took an unforeseen turn. Hit broadside by a car while en route to the Worcester Airport to go flying with a friend, Peg suffered multiple injuries, including broken ribs, a broken arm, and serious lacerations. But the worst injury by far was to her left leg. “I remember looking down and seeing my leg barely attached to the rest of my body,” she recalls. Brought to the trauma unit at UMass Medical Center, Peg remained fully awake and fairly confident that she would need to have her left leg amputated. Following the amputation, pain and fear were Peg’s most frequent visitors. “Pain was by far the hardest part,” she says, explaining that she vacillated between that pain and “feeling out of it” due to the pain medications she was taking. Peg’s work as a child psychologist had long been her life’s passion. Specializing in treating children who have experienced trauma, most of them adopted, she worried about “what would happen to my families if I didn’t return to work,” she says. 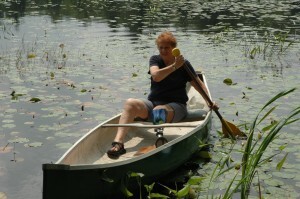 Peg’s amputation does not keep her from enjoying her favorite pastimes, including canoeing on the pond behind her home. The day after her admission, Peg had her first therapy session. “It wasn’t fun. Standing up that day felt impossible, and it took me a while to like that physical therapist, but I did by the time I left. I had fantastic therapists who balanced support with persuasion,” she says. 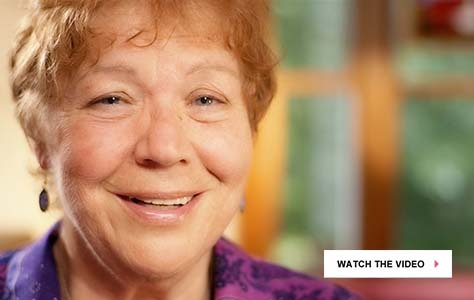 These days, Peg relies on that strength to enjoy nearly all the activities she did prior to her accident. Still traveling, canoeing, and flying, she returned to work just weeks after her inpatient stay at Fairlawn. It did not take long for Peg’s dog Dolce to get his walking partner back.